Graphic novel-interesting twist on the tradtional tale. The setting, action, and humor really surprised me. 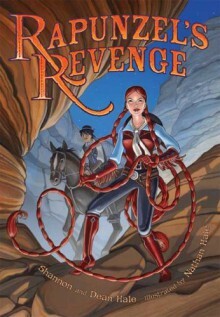 The stories of Rapunzel and Jack and the Beanstalk, reconceived as a Western. And as a critique of pure capitalism.Much funnier than expected from previous reading of Shannon Hale.